This week's Faculty Spotlight feature focuses on another Purdue Veterinary Medicine faculty member approved for promotion this year, the Director for the Center for Animal Welfare Science and Professor of Animal Behavior and Well-being Candace Croney. A Purdue faculty member since 2011, Dr. Croney is being promoted to full professor in the Department of Comparative Pathobiology. She also holds a joint appointment in the College of Agriculture's Department of Animal Sciences. Before coming to Purdue, Dr. Croney completed her PhD at Pennsylvania State University, and finished her postdoctoral studies at the University of Maryland, College Park. Then, she became assistant director of conservation education at the American Zoo and Aquarium Association in Silver Spring, Md., before accepting a faculty position in preventive medicine at The Ohio State University College of Veterinary Medicine. In 2014, Dr. Croney was selected to lead the newly created Purdue University Center for Animal Welfare Science. The Center's mission is to promote the welfare of animals through innovation in research, education and outreach. 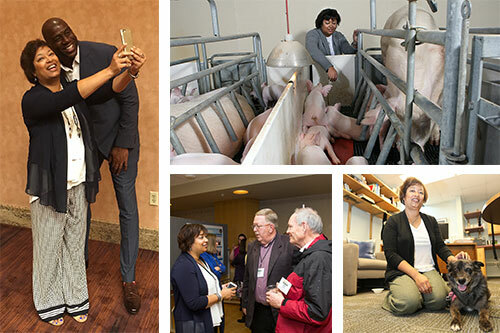 It hosts the largest collaborative group of scientists in the U.S. working in a variety of related fields and brings together diverse, cross-disciplinary approaches to animal well-being issues in animal and poultry science, veterinary medicine, psychology, philosophy, genetics, public health and zoology. Animal welfare was one of the main reasons that Dr. Croney wanted to become highly involved in veterinary medicine. "The opportunity to help the veterinary profession and animal agriculture make advances in this field and to have greater impact in this area was a major reason for my interest in the position I now hold," Dr. Croney said. Her biggest research and teaching interests include applied animal behavior and welfare, ethical implications of animal care, and public perceptions of animal agriculture. Outside of her work, Dr. Croney enjoys reading, art, and beachcombing, which consists of scanning a beach looking for objects of value or interest. Dr. Croney said that engaging with PVM students, faculty, and staff who care immensely about the health and well-being of animals is her favorite part about working in the College of Veterinary Medicine. Her advice for those wanting to begin a career in veterinary medicine? "Recognize the huge credibility asset that comes with being a veterinarian. Try to engage with as many people as possible about the importance of the various roles animals fill in our lives and how we can do more to provide them the highest quality of care we can."